Meet Helen - our Salford Girl and new Anglican Chaplain! We're thrilled to welcome Rev. Helen Tomlinson our new Anglican Chaplain to our University. Helen, who joined us late last year, has just been officially ordained by Bishop Mark of Middleton. From shorthand typist to University Chaplain, Helens career has spanned far and wide. Read a little more about Helens journey below. “As a Salford girl, I was brought up in the Christian faith, being taken regularly to a traditional family service, joining the choir and as I grew into teenage years, going to the various church youth clubs that were around at the time, but by the time I was married with a young family, I had not been to church for years, except for weddings or baptisms. However by reading the Gospel I suppose I had what you'd call an epiphany - I was ready to make a new commitment to God and started to go to church again." I’ve worked in a pub, in a lettings’ agency, in a solicitors, housing association and even as a singing waitress at a Jacobean Banquet! People at church would often suggest I should train for ordination, so much so I could no longer ignore it. I started my training for ordination in 2004 and then spent nine years working for the NHS as a medical Secretary. After a few years in Stretford, I moved to be a chaplain at The Christie Hospital where I stayed for five years"
I thought I was coming for interview experience when I applied for this job, but I’m old enough to know how God laughs at our plans sometimes! As it is, I feel very blessed to be part of this University and especially to work with such a brilliant group of people in the Faith Centre since it really is both a vibrant and a peaceful place to be. I enjoy working as part of a multi-faith team whose aim is to offer support to both students and colleagues of any or no faith and to offer a listening ear". My working week is usually Monday, Wednesday and Thursday each week 10am-4.00pm and I hold Holy Communion Service every Thursday in the chapel at 1.05pm followed by refreshments and a chat". Rev. 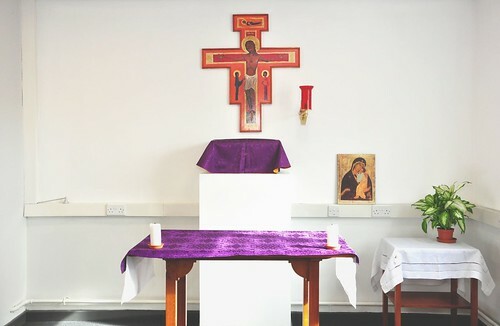 Helen's hours are Monday, Wednesday and Thursday each week between 10am-4.00pm and holds Holy Communion Service every Thursday in the chapel at 1.05pm followed by refreshments and a chat. You can contact Helen on h.tomlinson2@salford.ac.uk or on ext. 54660 or contact the faith centre directly on ext. 54432.